Poggionero 2012 was a good vintage for this authentic Tuscan wine, grown on one of the most beautiful estates I’ve ever had the pleasure to visit in Tuscany: Castelfalfi. The breakdown of grapes are 50 percent cabernet sauvignon, 40 percent merlot and 10 percent alicante. Twelve months in barrels resulted in this ruby-colored, depthful taste of Tuscany’s terroir translated into elegance and sophistication. Sipping on this wine brings back memories of my visit during a chilly spring Easter weekend, where I enjoyed dinner in La Rocca Castelfalfi, a castle that hosts a Michelin-star restaurant/chef. On my way to Castelfalfi, the winding road was almost invisible due to the distant fog. The weather’s uncooperative nature led me to drift in imagining myself meandering along the pathways that tied the estate together like the wrapping of a luxurious gift. All I was able to view was a peek of exquisiteness in the surrounding view. And that was good enough for the moment. The scene of rolling vineyards and Tuscan farmhouses pressed against a sleepy blanket of misty air was almost too beautiful to bear, to the point where my eyes moistened in thoughts of reality; this scene was not digitally-enhanced. The following day, as the fog unwrapped to a glorious definition of resplendent landscape I witnessed from my Hotel Tabaccaia terrace, I began to understand the succinct and sensory title of being under the Tuscan sun. 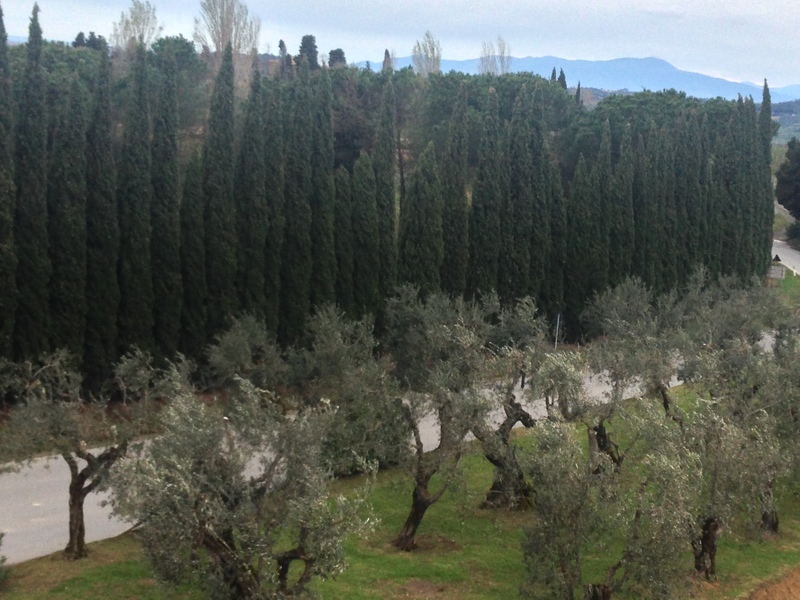 Olive and Cypress trees at Castelfalfi Resort in Tuscany. From Florence, the drive to Resort Castelfalfi is approximately one-hour, and the conversation about the habits of wine drinkers in Italy versus the U.S. revealed just what I imagined — that drinking wine is part of a culture in Italy, while in the U.S. it is an indulgence triggered by the need for social lubricant. In Italy, a child grows up drinking wine diluted with water, which educates the palate for tasting wine to its fullest potential by the time of adulthood. In fact, as part of a debut into adulthood, in Italy, participation in a wine harvest is a ritual experienced for youth “coming of age.” With this concept in mind, I cannot help but wonder if what I taste at Castelfalfi might only be tastier had I been drinking diluted wine as a young girl growing up in the U.S. Alas, I was not in the U.S., but in Tuscany, where I plan to return time and time again, if not for the wine, but for the olives and oil, as well as the incredible Italian dishes and friends I made along the way.